From the beginning Laurel and I knew it needed to be a jewel box. Sweet Laurel has always had this “secret garden” quality. 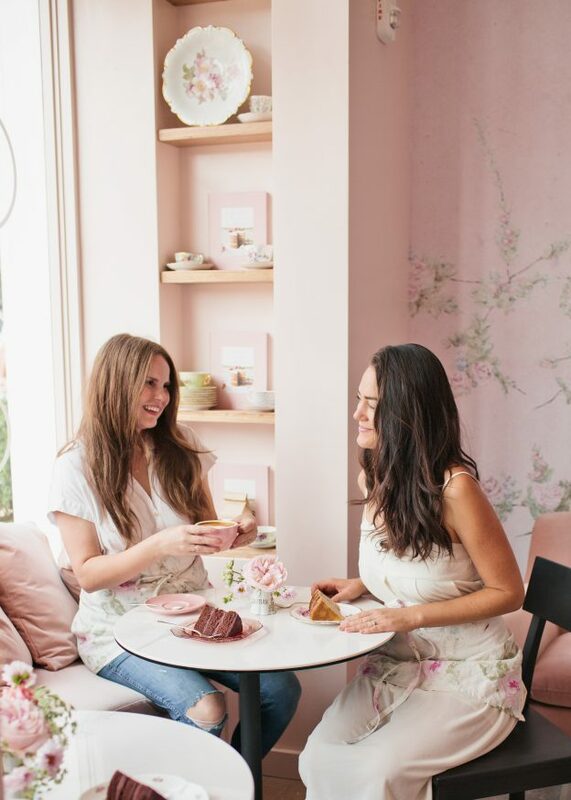 Our only form of marketing was through word of mouth, and I wanted the space to reflect that: like stumbling into an English tea room in the middle of LA. It feels like you’re in on a wonderful secret. Pink is our color, and being mothers to sons, we joke that the store is our daughter. It’s hyper-femme, but still modern. The phrase “mayfair meets Malibu” kept bouncing in my head,. 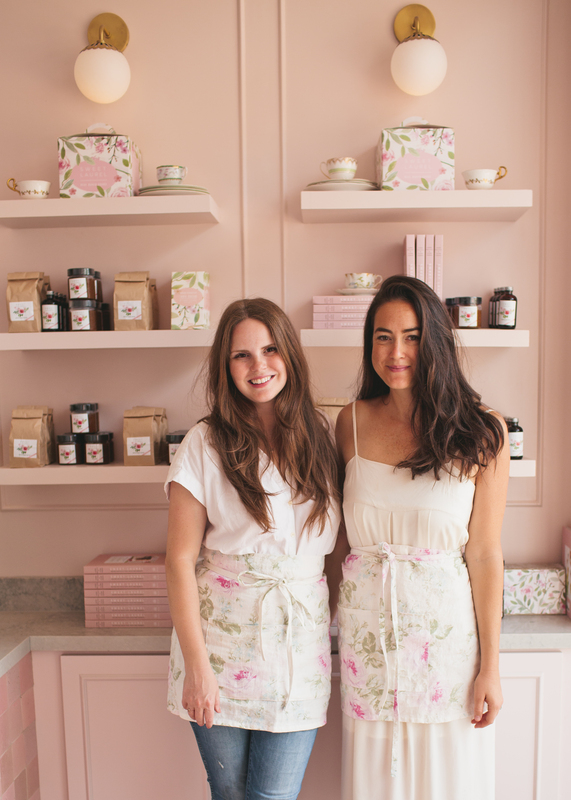 Laurel and I love garden roses, and the storefronts in Mayfair in the springtime were a huge inspiration. Sweet Laurel is like a city girl in the country. It’s comfortable and filled with antique touches, but is essentially modern and unfussy. No lace doilies here. 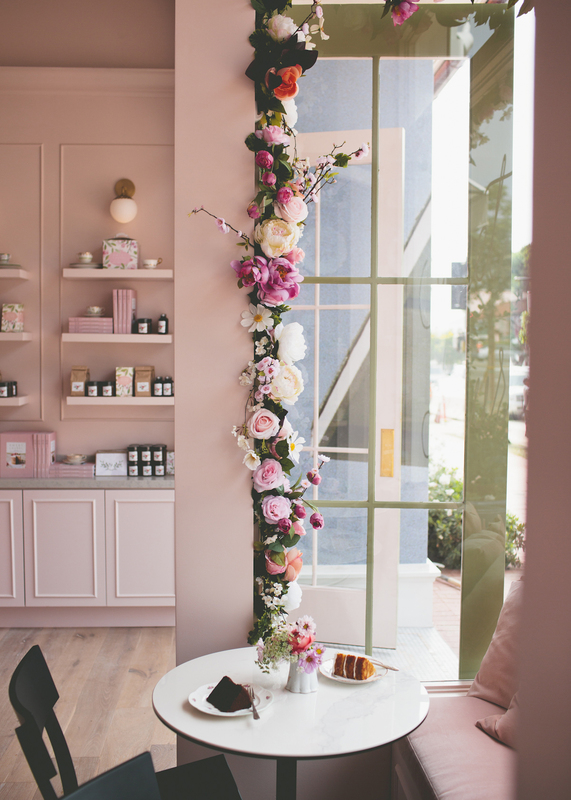 The iconic Jam Cake has been our visual touchstone from the beginning, so the look of something romantic but unfussy, covered in garden roses, is really the heart of our look. 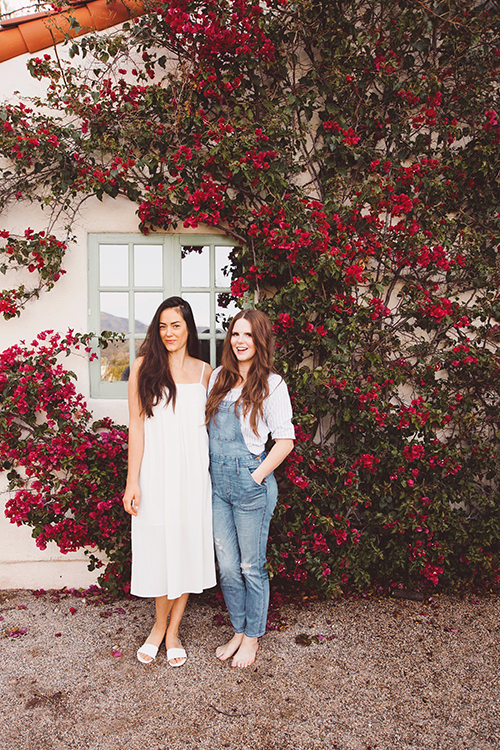 Our dear friend Lauren Conrad let me raid her garage for tea cups to decorate the space with, and my family friend and epic Santa Monica caterer Sandy Miller let me get a sneak peek at her estate sale before she moved. I basically swept through and grabbed all of the Limoges and Haviland I could find. We really benefited from their amazing taste! Texture was hugely important to the space. If everything is pink, it needs to to have layering to break it up, otherwise it’s like walking into a wad of chewing gum. It also needed to feel grown up and elegant, not like a little girl’s room, so I focussed on mixing modern, minimalist pieces like the Mitzi light fixtures (and here), Room and Board furniture (sofa, table, chairs), and menu board with more old world pieces filled with character and texture. The tile from Cle has incredible variance, and the floor from Du Chateau feels like it was pulled from an old European home. The countertops, Caesarstone Noble Grey, are not only incredible durable, but elegant as well. 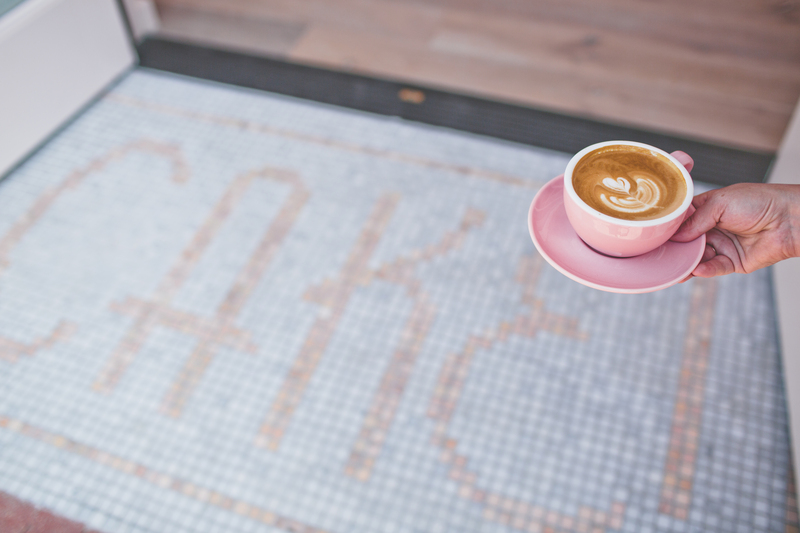 We wanted something soft gray, with stone-like detail, but marble was way too fussy for a busy coffee bar. Caesarstone being more resistant to scratches, chips and cracks than both marble and granite as well as many other natural and engineered surface materials was a huge plus to us, considering how much wear and tear the counters were going to get. 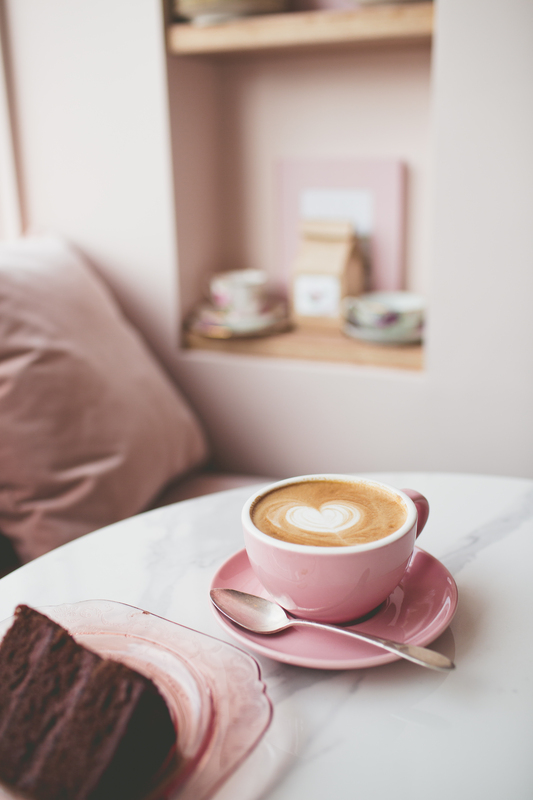 For the espresso bar in the back, the counters being naturally nonporous and requiring little maintenance is a huge plus. This means that with a Caesarstone surface, we will never have to worry about sealing, stains or bacteria growth. Honestly, in the short time the shop has been open, it is crazy how much use it gets – so having all of these benefits are so important to us. 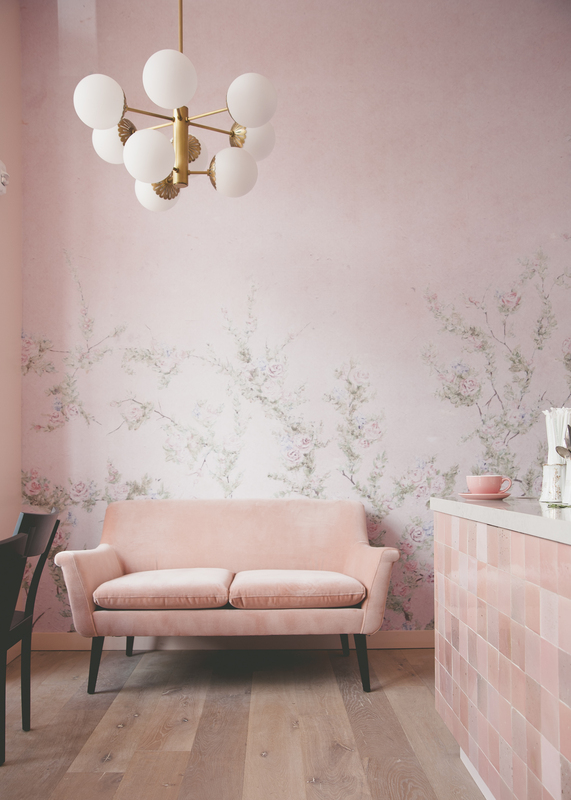 My first image of the space was a hand painted mural, a modern chandelier, and a pink velvet couch underneath. I couldn’t stop picturing this vignette, and it sort of became the guiding light of the space. When actually painting a mural became too crazy, I reached out to Anewall and they created the most stunning wallpaper for us. I can’t wait for people to be able to purchase it for their own home. Laurel is obsessed with bay windows, so we knew a banquette was a must. 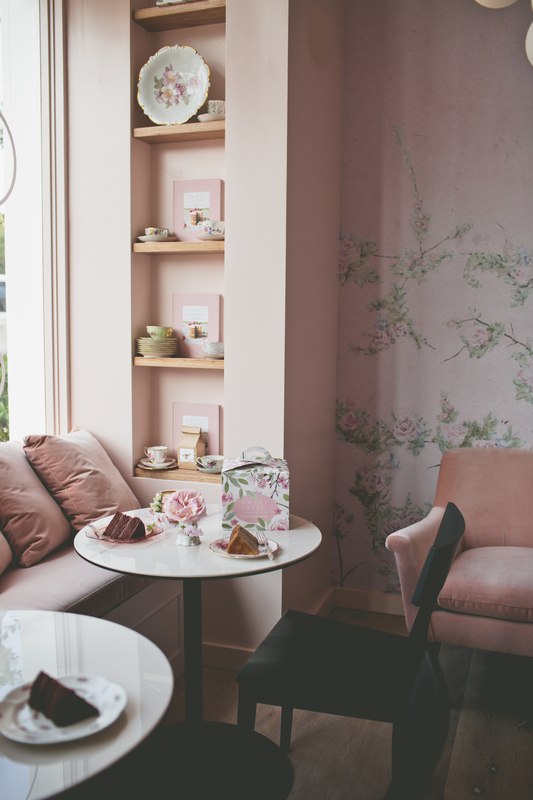 All of the natural light, with casual pink velvet pillows makes it the best angle to enjoy our shop. People’s reactions to it. When I hear an audible gasp followed by “It’s so pretty!” it makes me light up. 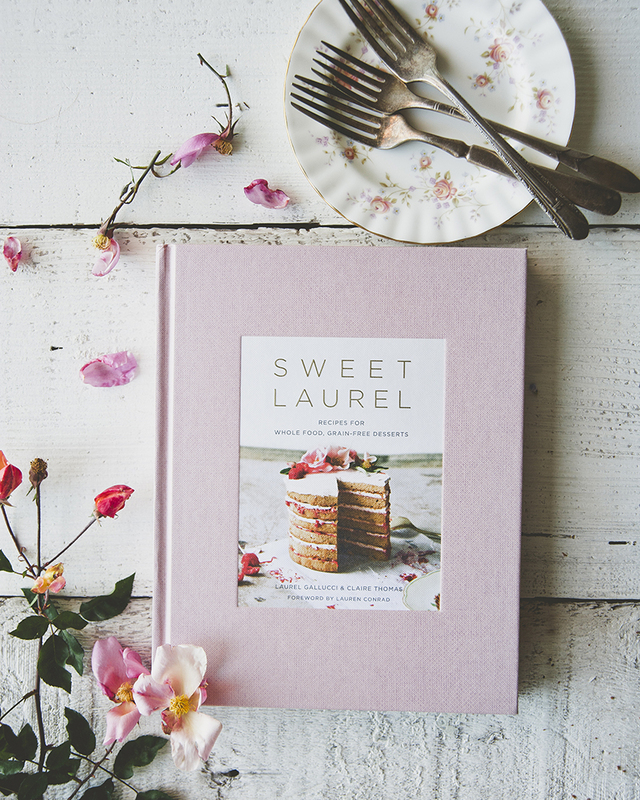 It’s so exciting to see Sweet Laurel as a brand exist three dimensionally rather than in a cookbook or on a plate. We finished the basics of the space about 72 hours before opening, so we were in sweatpants getting everything ready to the last second. My husband teased me because I was up at 2am making the faux floral garlands that are around our window. It was crazy, but worth it! We have to give Andrew Kim, our architect, a big shout out. He always had creative solutions, and helped us realize the vision beautifully. This entry was posted in baking, beauty, breakfast, brunch, chocolate, collab, dessert, dinner, diy, drinks, event, healthy, holidays, lifestyle, mommy, motherhood, seasonal, snacks, Uncategorized, wellness, winter, workshop and tagged cake, cake recipe, cake shop, cakes, coffee, coffee shop, cupcakes, dairy free, design, grain free, grain free baking, grain free bread, interior, interior design, paleo, paleo cookies, paleo dessert, paleo sweets, refined sugar free, sweet, sweet laurel, sweet laurel bakery, sweet laurel cookbook, sweet laurel vanilla extract, sweet treat, sweet treats, sweetlaurel, sweetlaurelbakery, sweets, vegan caramel coffee on December 19, 2018 by sweetlaurel. So beautiful! Are those aprons available at all?